This quad core phone of O+ USA is available on Smart Postpaid All in Plan 350. You’ll get the services from the network plus a free O+ 8.96 Quad core phone for 350 pesos monthly. Get this 5.0 inch phone with 5 megapixels rear camera and 2 MP on front. Another affordable offer from Smart Postpaid, this plan is the latest addition on All-in denominations from Plan 500 they now made it even more budget-friendly. 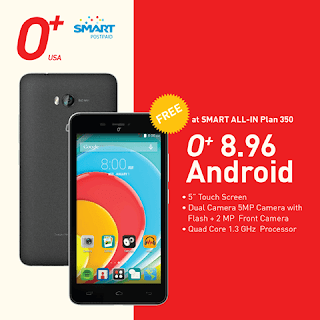 If you’re interested to get this O+ (Oplus) phone, you can visit your nearest Smart Store and inquiry for more details and requirements on how to apply All-In Plan 350. If you want to get O+ 8.96 in cash, this now retails below 5000 pesos price.